VERSAILLES, FRANCE--(Marketwired - Apr 5, 2016) - Today at the New York Times International Luxury Conference, HP Inc. (NYSE: HPQ) brought to life the premium PC experience with world-renowned designers Tord Boontje and Jess Hannah, unveiling two distinct, limited edition notebooks that encapsulate luxury with texture, diamonds and 18K gold. 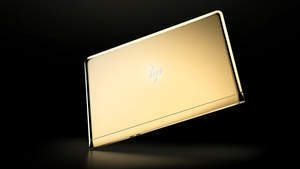 Based on the13.3" (diagonal) HP Spectre, the world's thinnest laptop(1), Boontje and Hannah worked side by side with HP designers to conceptualize and construct their own unique, lavish designs. A limited number of devices from each designer will be auctioned at the Cannes Film Festival in May with the proceeds going to the Nelson Mandela Foundation. "We have brought in the designers to create an extraordinary experience on our thinnest laptop ever, reinventing how luxury design and powerful laptop technology can come together to create spectacular works of art," said Stacy Wolff, vice president, design, personal systems, HP Inc. "We are showcasing the possibilities of marrying technology with glitz and glamour, allowing the PC to become an expression of style." Jess Hannah, a Los Angeles-based jewelry designer of eponymous line J. Hannah, created the HP Spectre by J. Hannah with opulent 18K gold. The notebook top and rear is completely plated in 18K gold with a highly polished finish. HP's logo is encrusted with diamonds, each carefully placed by a diamond setter. Even the keyboard deck is plated in 18K gold to match the top cover and the power button is covered with diamonds for sparkling brilliance. The all over gold accented with a hint of sparkling diamonds displays Hannah's minimalistic design philosophy. The PCs will be auctioned with the proceeds supporting the Nelson Mandela Foundation, a non-profit organization focused on memory, dialogue and legacy work, founded by Nelson Mandela in 1999. They are the custodian of his life and times, and are a committed facilitator of his living legacy. The organization promotes Mandela's lifelong vision of freedom and equality for all. (1) Based on HP's internal analysis as of 2/10/16 of vendors shipping > 1 million units worldwide annually with clamshell design, Windows or OSX, priced > $400USD, measured at z-height. 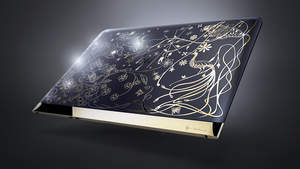 Dutch-born, London-based designer Tord Boontje created the HP Spectre by Tord Boontje that exhibits delicate, intricate and dreamlike pattern across the laptop. The 18K gold plated accents provide rich contrast with the patterns that gently intertwine with embedded Swarovski crystals set in a floral pattern against a deep Midnight Blue. Los Angeles-based jewelry designer Jess Hannah created the HP Spectre by J. Hannah with opulent 18K gold. The notebook top and rear is completely plated in 18K gold with a highly polished finish. HP's logo is encrusted with diamonds, each carefully placed by a diamond setter. The all over gold accented with a hint of sparkling diamonds displays Hannah's minimalistic design philosophy.